Sarutahiko Coffee occupies the left-hand side of the ground floor of a modern, inelegant brick-built building. A central passageway runs through the building and Sarutahiko’s right-hand side, which runs along the passageway, is essentially one long window. This, coupled with an all-glass front, potentially makes it very bright. However, since it’s well set back under an overhanging brick projection, in reality it’s a shady spot, despite a south-facing aspect. There’s not much to Sarutahiko: long and thin, the front section is maybe twice as deep as it is wide, with the counter at the back, effectively cutting the space in two. Behind it, all the coffee is made almost out of sight in a windowless space. There’s enough room for a row of three V60s in the front on the left, then at the back, along the right-hand wall, there’s a two-group Synesso espresso machine. The seating is also rather crammed in, a sharp contrast to the open, airy spaces of the Omotesandō branch. There’s a two-person table outside to the right of the door and, when it’s not too hot (ie not during my visits in 2018 when it was 35⁰C), there’s a group of chairs to the left. Inside, a row of five two-person tables with stools runs along a bench on the left-hand wall, while a narrow bar to the right of the door doubles as a takeaway station. A four-person window-bar runs along the first part of the right-hand side, followed by a set of retail shelves which merge into the counter. During my three visits it was always busy, people often queuing down the centre. Watching the staff at work was something special: wherever possible, someone would greet new customers as they enter with menus supplied to any queue, often along with samples of coffee. I tried the single-origin espresso, a Panama Mama Cata, on my 2017 visit. Described as light and fruity in contrast to the dark, bitter house-blend, it was served in a gorgeous cup, one of the prettiest I’ve seen, but other than remarking that it was “lovely”, I cunningly forgot to take any notes. On my return, exactly 15 months later, little had changed. This time I tried the pour-over, selecting the Bolivian Agro Tokest Typica, one of the lighter roasts. My coffee was again lovely, only this time I took notes, which tell me that it was very smooth, well-balanced and with delicate flavours (as you can see, my note-taking rarely adds much!). This was served in a small mug with an over-sized handle, Sarutahiko’s logo arranged on one side, so that if you drink right-handed, like most people, the logo is facing outwards. This struck me as an interesting advertising strategy, although personally I’d have put the logo on both sides. I returned for a final visit later in the week to try the single-origin espresso, a Bolivian Taypiplaya, again served in a gorgeous cup. This had a very strange, albeit nice, taste, almost smoky, not something I’ve tasted in an espresso before. I also bought a bag of a medium-roast Kenyan Gicherori to bring back as a gift, ordering it as a pour-over as well. After my experiences at Koffee Mameya, I was a little nervous, but this roast is not as dark, resulting in a wonderfully rich coffee with the fruity taste that I associate with Kenyans, but in a different frame, so to speak. I left on something of a high, with the icing on the cake being the staff, who, if they can, come to the door to say goodbye when you leave. December 2018: Sarutahiko Coffee Ebisu was a runner-up for the 2018 Happiest Staff Award. 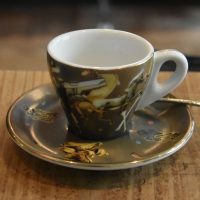 You can see what the Commodities Connoisseur made of Sarutahiko Coffee in Part 4 of his excellent Tokyo coffee series. This entry was posted in Cafe/Roaster, Cake, Coffee Shops, Evening Opening, Laptop Friendly, Late Opening, Retailers, Stations Nearby, Tokyo and tagged include, Sarutahiko, Tokyo2018 by Brian Williams. Bookmark the permalink.